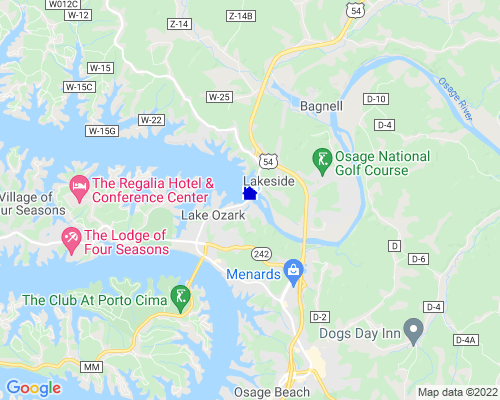 Lake of the Ozarks is located approximately 180 miles from St. Louis, 170 miles from Kansas City, or 90 miles from Springfield, MO or 140 miles from Branson, MO. The shoreline of Lake of the Ozarks is more than 1,150 miles. This allows visitors and residents to enjoy many recreational activities such as two (2) scenic State Parks, boats, boating, camping, parasailing, water-skiing, spelunking, water parks, excursion cruises, scuba-diving, bungi-jumping, tubing, swimming, horseback riding, mountain biking, golf, miniature golf, country/western musical events, fishing, crafts, R/C Racing and go-carts. In addition, the Lake offers a great selection of lodging and dining facilities, including several that are five-star rated. There are also many opportunities for commercial and residential development. This area is a wonderful place to live or vacation. Depth of Lake: 8 ft.
Lake of the Ozarks offers it all. There are some of the best golf courses there,fishing is good, there is something for everyone, water parks, miniature golf, bumper cars, 101 store out let mall, antique stores and much more.